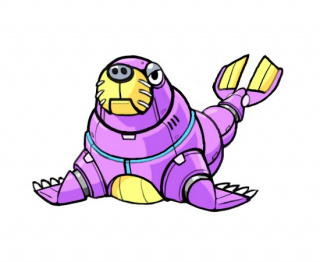 Steelion, or Dodon (ドドン) in Japan, is a purple sea lion-like Badnik from Sonic the Hedgehog 4: Episode II found exclusively in White Park Zone Act 3. Steelion attacks by emitting a freezing pulse from its mouth, freezing a small area in front of itself. The main purpose of this attack is to block off the player from taking shortcuts or reaching a safer area. If the player is in the vicinity of the pulse when it's performed, the player will take damage. Steelions tend to perform their attack as soon as the player approaches, making them hard to defeat. This page was last edited on 2 May 2018, at 07:56.